SECURELY ORGANIZE METAL ITEMS - From hammers and wrenches to metal spatulas and spoons, our screw mount 12" tool holder will keep all your metal utensils, parts, and pieces off of your work surface but still within arm's reach. This magnetic bar strip is the right storage solution for your garage, kitchen, or home office to conveniently and securely house all your metal accessories. 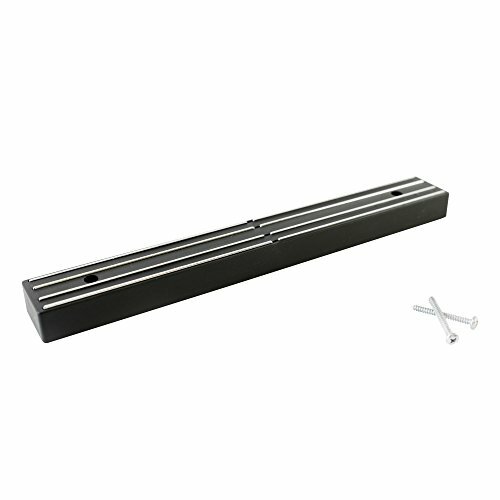 STRONG AND DURABLE FOR MAXIMUM HOLD - Manufactured to hold up to 30 pounds per inch, Master Magnetics toolbar will maximize your workspace by safely keeping all of your metal parts up and out of the way, while still having them easily accessible. The strength of magnetic pull is determined by the iron content of the tool or part. Our magnet bar is an easy solution to organize all your metal parts. SIMPLE INSTALLATION - Two pre-drilled holes in our toolbar strip makes setting up quick and easy. Everything that you need to use Master Magnetics magnetic tool holder is included with your purchase, even the screws. With this simple setup, you will be able to install your magnetic tool holder virtually anywhere from the kitchen to the garage. To remove, simply unscrew the bar from the surface. MADE FROM HIGH-QUALITY MATERIAL - We constructed our magnetic organizer and storage bar with heavy-duty steel strips, hard and strong plastic, and ceramic magnets. The combination of these durable materials works together to create a magnetic tool holder that is attractive and dependable. At Master Magnetics we know how important it is to manufacture magnets the right way to ensure maximum performance. HANDSOME SLEEK DESIGN - At Master Magnetics we have made your tool organization options beautiful with the simple and sleek design of our magnetic strip. The bar has an attractive flat black coating to bring style to any room. Magnets on the back for installation allow more focus on the simplicity of the toolbar making it easy to organize your metal tools, utensils, and iron pieces in any room!